I have only been here about two months. I have a good friend who will retire from the navy in April as an E9. He saw my Facebook post about my sewing machines and he said make me a quilt. I promised him atleast a bath robe snuggling. He can sew when he wants to also. I need to actually present him a quilt. It’s something I said I might do. I’m not a good sewing guy I only came to learn the mechanics of sewing machines. I do like to sew on the 15-91. I need a simple quilt I can sew and present I’m thinking queen size to fit his motor home. I also have a 211 G I have not figured out how to operate yet. I was thinking waaaay simpler. Like a four patch or something similar. They are really pretty and easy to stitch one up. The 15-91 can handle duck. 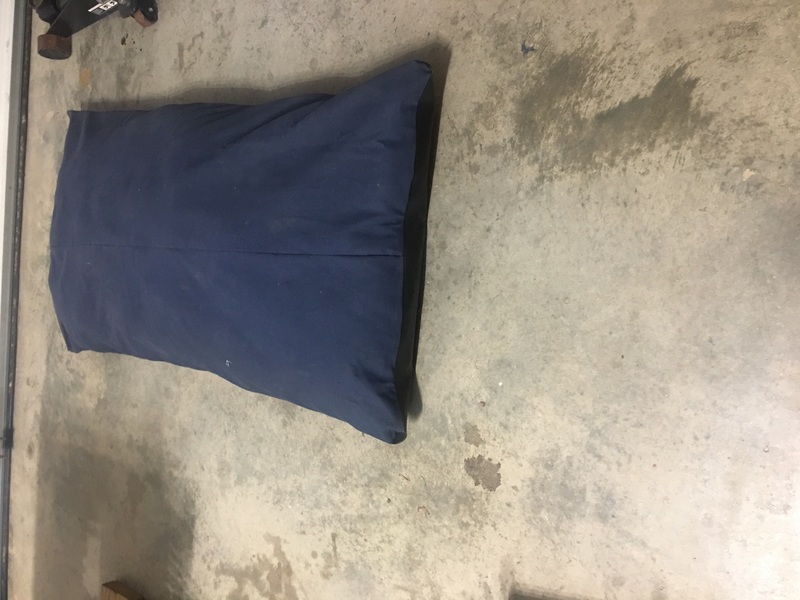 I made a dog bed with duck on mine. Use a 1/2 inch or wider seam because duck can fray. It's no fun to pull a quilt out of the washer with ripped seams. If you are sewing for an RV, remember that the bed is a short queen. If there is too much drop on the quilt, it will cause a trip hazard every time a person walks around the bed...speaking from experience..
Why is the little devil on my shoulder whispering Storm at Sea? It's really just straight seams (and small pieces). 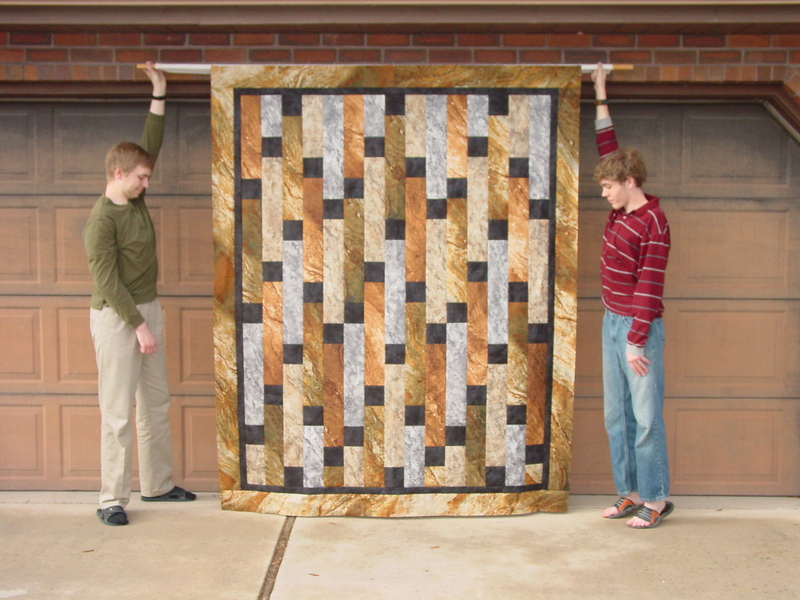 A panel quilt will turn out very well, and you could place it in a "sea" of four patch blocks. H Doug, I've meant to say it before, welcome to the board! You could also consider that as a small-ish quilt that could be folded in 1/3 and flipped off the corner of his couch or easy chair. In view and appreciated, and jumping off place for learning to make quilts down the road? I love my vintage machines and have learned so much from the combined knowledge and sharing attitude found here. Did you know about Quilts of Valor and Quilts of Honor goings on? Something close to your heart that might making it worth exploring the simple but critical points of making fabulous quilts? Again welcome, Sharyn/KalamaQuilts Thank you for your service. IMHO, keep it small and simple on a first quilt. You'll learn a lot and won't drive yourself to despair. And, forget the duckcloth. Stick with the tried and true. You'll get tons of help here.... answers to all your questions. Above all, relax and enjoy your new quilting experience! Welcome to the QB! I made a military themed sampler quilt for my CWO husband, but it was a pain to put together. Any of the Eleanor Burns' quilts go together quickly. Trip Around the World is a good one, and her Irish Chain leaves a nice center area in the block that would be good for embroidery or military themed fabric. Lots of cutting in both of those. A four patch would be easy and quick. You should have some quilt shops in your area that could help with ideas. Edited to add: Your idea sounds like a good plan, but you might check out quilting cottons instead of the duck. I know you military guys like stuff that will last, but 100% cotton lasts a long, long time if cared for properly. Last edited by coopah; 01-25-2019 at 05:39 AM. Have you seen the preprinted panels for each of the Armed Forces? They make a nice starting place. 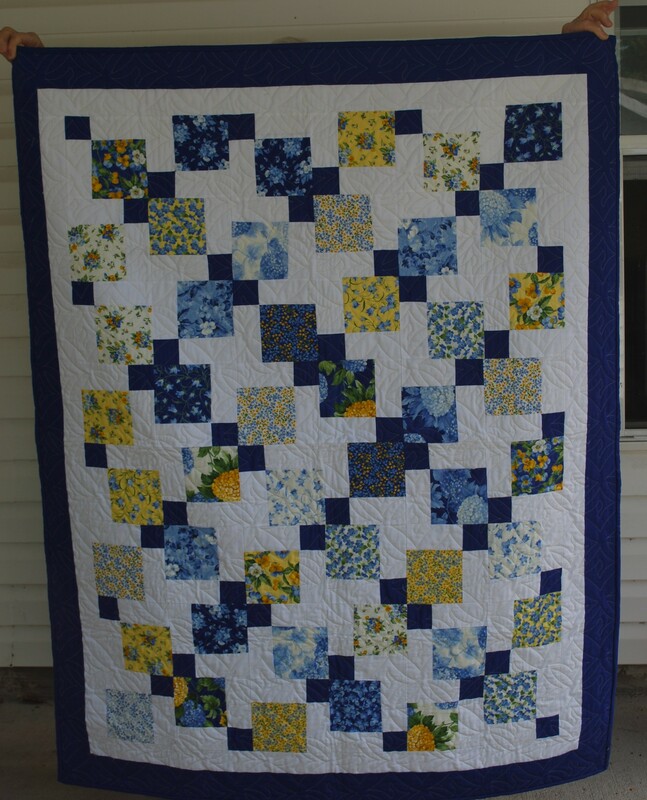 I agree the duck would not make the best quilt and would be really tough to Free Motion Quilt after doing the piecing. I suggest looking for a navy pre printed panel that could be cut apart and reassembled into a quilt. Add borders etc. Try etsy. I disagree. 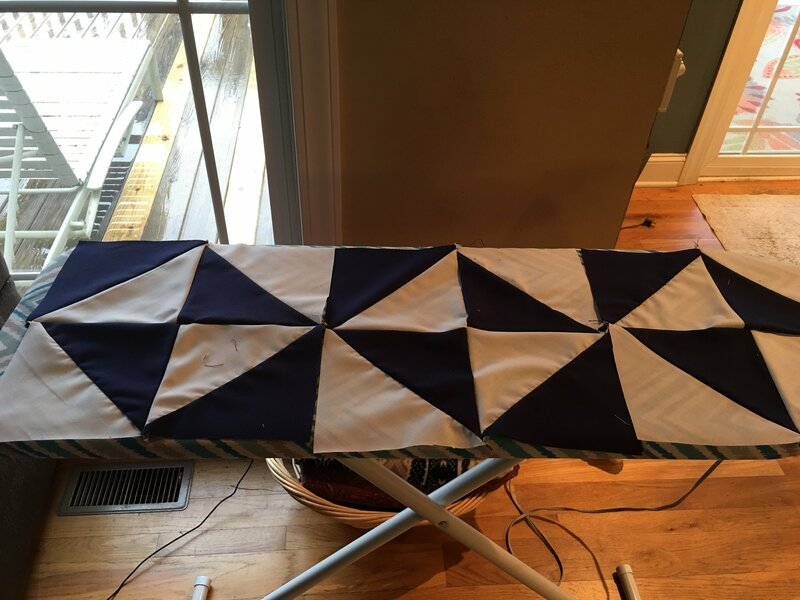 Having made one quilt by cutting a panel apart and making it into a quilt, I want to let every one know that it is a difficult process. It's hard to get it right. Working on the second one, I double down on that "hard to get it right" comment. Pre-printed panels are great. Cutting them apart and getting all the stuff to line up is not easy. Using a panel as the centerpiece of a quilt is a great idea. Add blocks around the sides, add multiple borders or a combination thereof. Just don't cut it up unless you are prepared to spend lots of time with Mr. Seamripper. I sewed this dog pillow on my 1910 singer model 27 all treadled. It’s duck cloth on top and marine grade vinyl on bottom. I’m confident the 15-91 can do it also. When I was looking at quilts before all I ever saw was a bunch of squares sewed together. I put my reading glasses on and I can actually see the quilting. The actual quilting is why duck cloth is a horrible idea. I always think if I can treadle it certainly my potted motor machine will smash it. im am still frightened by that video. I found the Missouri Star pattern of out of Time hour glass. I think it is a dizzying pattern because it also lends itself to optical illusion/ conclusion. Looks like pin wheels but it’s time ticking away. I might just put something in the middle but I’m totally over doing anything about the NAVY. He has already served 30 years. Wall hangings don’t really lend themselves to campers. *Use your cell phone camera to view fabric choices under black/white contrast. Generally you'll want to pick lights, mediums, darks. Two color quilts are stunning, however. Have fun with the project. Keep learning. Mistakes are inevitable and generally fixable. My unfinished blocks should have been 14". I think mine turned out to be about 13 1/4". It was still fine and I was happy with it. I have not actually purchased any cloth yet! I may have a local person interested in trading my 1901 model 27 carcass for some fabric. I’m pretty sure I’m only going to quilt the blocks. It would be awesome to have it fancy quilted. It’s brother to brother he will get what I give him and he will understand. If I get it professionally quilted it cheating hell I could buy a quilt for him. Bkay, love your D9P - and, blue and yellows are my fave! Dougster - I love the piecing, not the quilting. It's not cheating to have the longarming done - it just gives me more time to focus on what I love to do. Whether you piece or use wholecloth, tie or quilt, your gift will be amazing! Bkay that's a really pretty quilt, you did great. Thanks, Cari. I still like that quilt. I made it for my sister, but still have not given it to her. I had planned on the "cornerstone" layout, but my blocks were not consistent enough to make that work, so this is what would work. I was well pleased with it for the first one. I'm also glad I sent it out for quilting. So I started sewing some squares yesterday with the 15-91. Made three blocks just as to practice and adjust my process. I think I’m on my way don’t judge the piecing yet? I still want to add the small triangles on the corners / I think it’s called a snow ball. You're on your way! Those blocks look great as they are. Nice pinwheels! Thanks for showing us your progress. Yes there are pin wheels also there is hour glasses and if I put the triangles on the corners it will be even better hour glasses with the pin wheels. Originally I wanted to do a navy themed quilt but decided he has had enough navy. Jenny’s out of time hour glass quilt inspired me, what says retirement more than out of time. I haven’t been back to sewing since the hour or so on Sunday. Maybe tomorrow after work. I might cut and press all of my sewn squares tonight. Supposed to be 75 degrees tomorrow in eastern North Carolina. I like to sew with the natural sunlight. My garage lighting is lacking. I find quilting a lot li manfacturing. Each process in independent from the other. In the end end all processes must be with in tolerance to assemble the product. Im satisfied with the blocks I have so far. I can see how this could get catawampus really quick during assembly.